Forrest Gump jogged through Montana on his trek across the United States and back. Two scenes shot in Montana appear in the movie. Both were filmed in northwestern Montana in or near Glacier National Park. The golden wheatfields that appear briefly on screen are near Cut Bank, Montana. 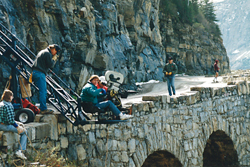 In another scene, Forrest runs across a stone bridge, with jagged snow-covered mountain peaks in the background. This scene was filmed at the St. Mary Entrance to Glacier National Park. The famous Going-To-The-Sun Road, which crosses Glacier Park, runs from St. Mary on the east side to Apgar Village (where scenes from Beethoven's 2nd were filmed) on the west side. Additional footage, shot along Going-To-The-Sun Road, ended up on the cutting room floor. Jim Hanks, Tom Hanks' real-life brother, doubled as Forrest Gump for the scenes shot in Montana.